Yadav said that it follows the outcome of civic polls held in Uttar Pradesh where the ruling BJP bagged 14 of the 16 mayoral seats as well as a sizeable chunk of the Nagar Palika and Panchayat posts. 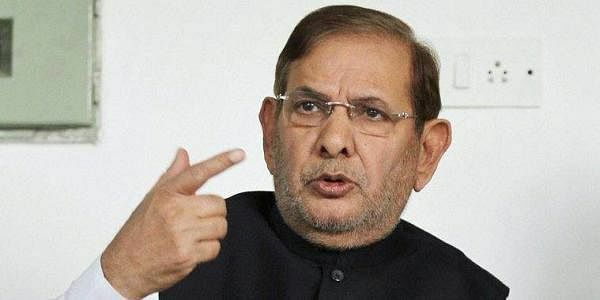 VADODARA: Rajya Sabha MP Sharad Yadav said today that leaders of the opposition parties would be meeting in the next two days to discuss a strategy to prevent the tampering of Electronic Voting Machines (EVMs) in the forthcoming Gujarat elections. Talking to the newsmen here late this evening, Yadav said that it follows the outcome of civic polls held in Uttar Pradesh where the ruling BJP bagged 14 of the 16 mayoral seats as well as a sizeable chunk of the Nagar Palika and Panchayat posts. To support his claim, Yadav circulated a statement giving details of the BJP's performance in the 16 municipal corporations where EVMs were used and the Nagar Parishad and Panchayat seats where ballot papers were used. "There has been huge noise around the wave of Modi and Yogi being the cause of the BJP's victory in Uttar Pradesh civic polls. Fact is that wherever voting was done through EVMs, BJP has won and wherever ballot papers were used, the BJP has lost," said Yadav. He criticised Prime Minister Narendra Modi for comparing the elevation of Rahul Gandhi as Congress president to the rule of Mughal emperor Aurangzeb. Yadav said that Gandhi did not run after power. "He could have become PM in 2004 and 2009 if he wanted to. I was witness to it," Yadav said. He slammed the PM for not being able to provide jobs to seven crore youths as he had promised. "Three and a half years have passed and only seven lakh jobs have been created. The PM has not provided 150 ppercent more that the Minimum Support Prices (MSP) to farmers nor has he provided a home to a single tribal in the tribal-dominated areas of Gujarat," said Yadav. He also alleged that tribals were being subjected to police atrocities and cases being registered against them on the eve of the assembly polls. Meanwhile, Congress leaders from Gujarat met Chief Election Commissioner (CEC) AK Joti in Ahmedabad two days ago and urged him to deploy adequate security personnel in the sensitive constituencies in the state. The Congress has also demanded that jammers should be installed at strong-rooms where EVMs will be stored after the polling.